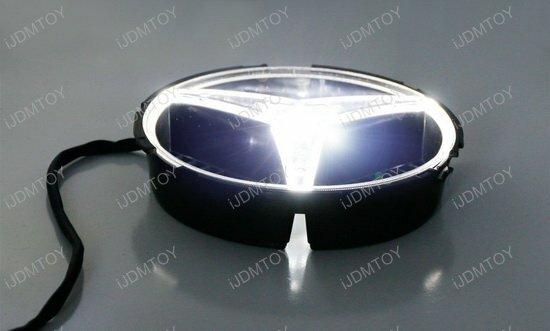 Q: How can I find out whether or not this backlight base will fit on my Mercedes? Measure the distance between the two lower star points. If it measures at around 5.5 inches, this product can fit. Check to see whether your stock emblem base is solid or see-thru. If it is see-thru, this is the right version for you to purchase. Look up the OEM part number of your original emblem base. 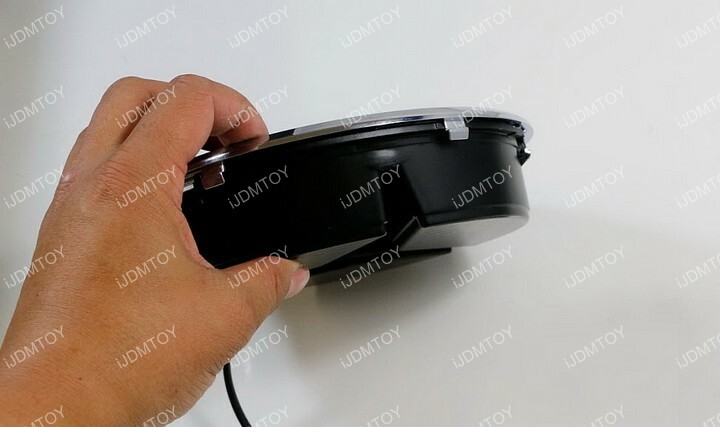 This product will fit if its part number is A2078880260. 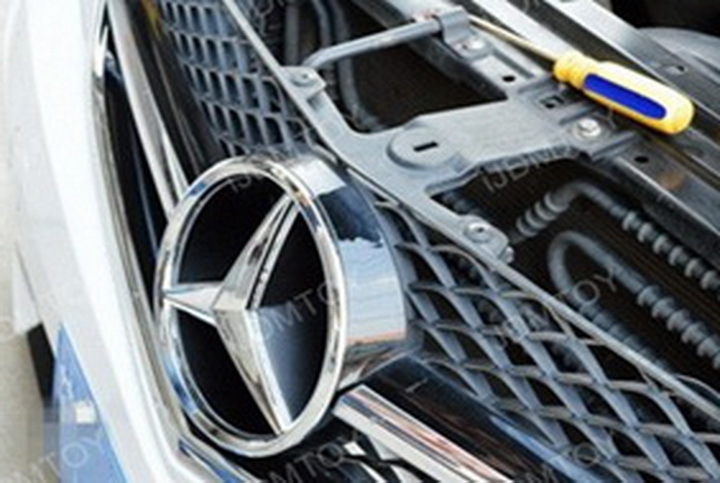 Q: How do I remove the Mercedes Benz emblem? A: Open the hood to gain access to the area behind the grille. 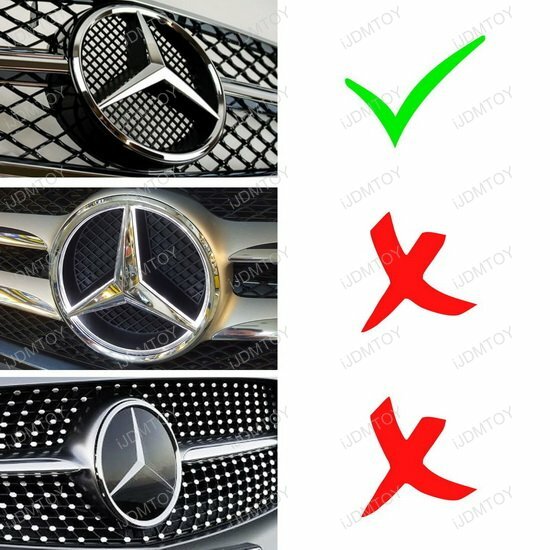 Release the plastic clips to remove the stock Mercedes Benz emblem. 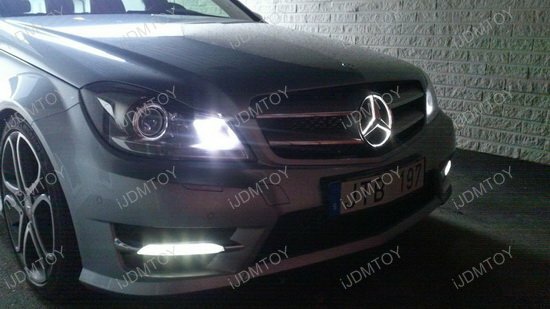 Q: How do I install this illuminated LED base for the Mercedes Star? 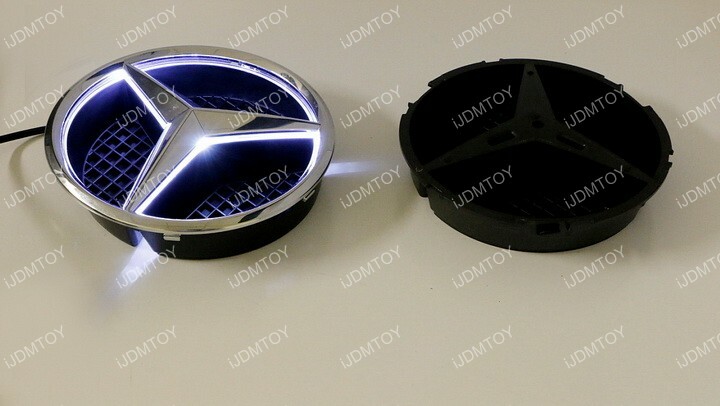 A: Let's compare the iJDMTOY illuminated LED base for the Mercedes emblem (left) and the original Mercedes lightless star emblem (right). The kit comes with the illuminated base ONLY - you will need to use the original emblem and slight modifications are required for installation. 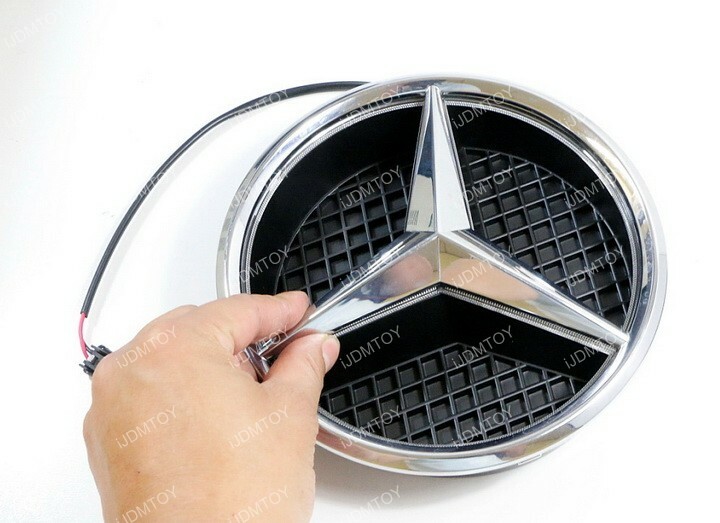 Step 1: Remove the original Mercedes star emblem base by releasing the clips from behind the grille. Detach the star emblem from the base. The emblem is only the top part of the assembly is and what you need for the installation. 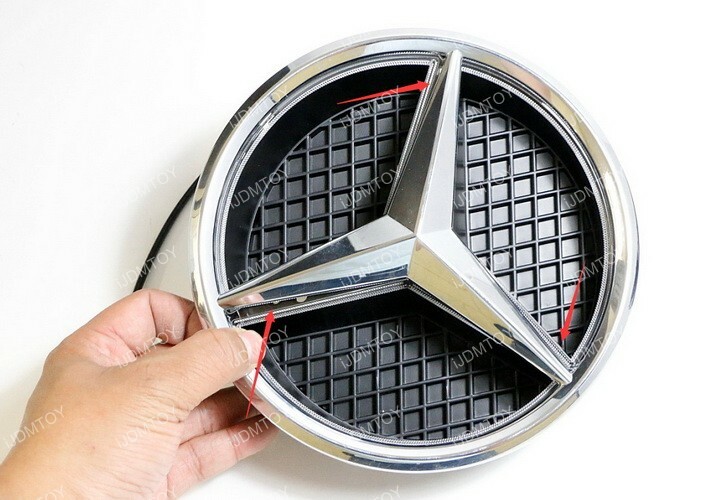 Step 2: Flip over the original Mercedes emblem and locate the 2 tabs on the star arms. Lift up the tabs and remove them from the emblem. 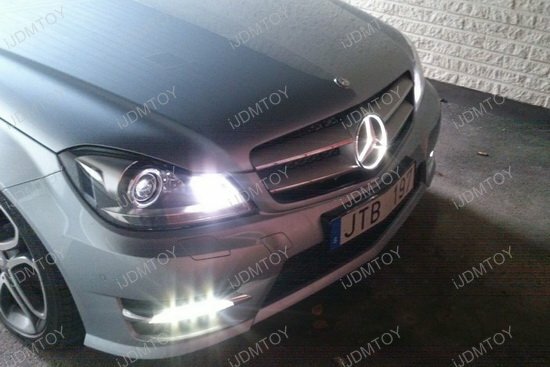 Step 3: Take the original Mercedes star emblem and the iJDMTOY illuminated LED base. 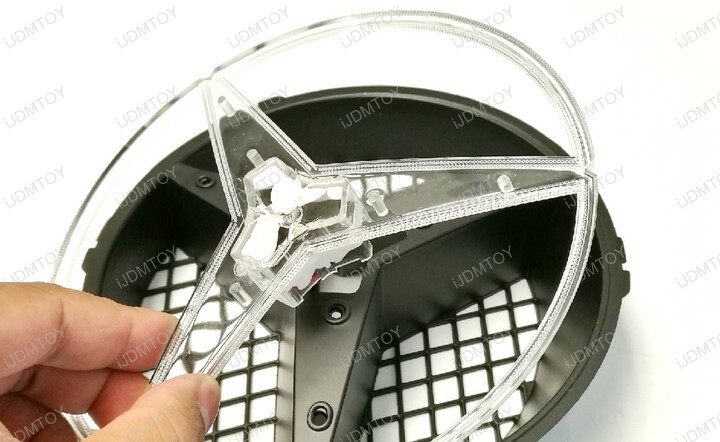 Place the Mercedes emblem on top of the LED base and make sure the arms line up together. It may seem that the arms are equally spaced, but they actually are not. If the arms don't line up exactly with the LED base, keep rotating the emblem until emblem arms line up with the LED base. 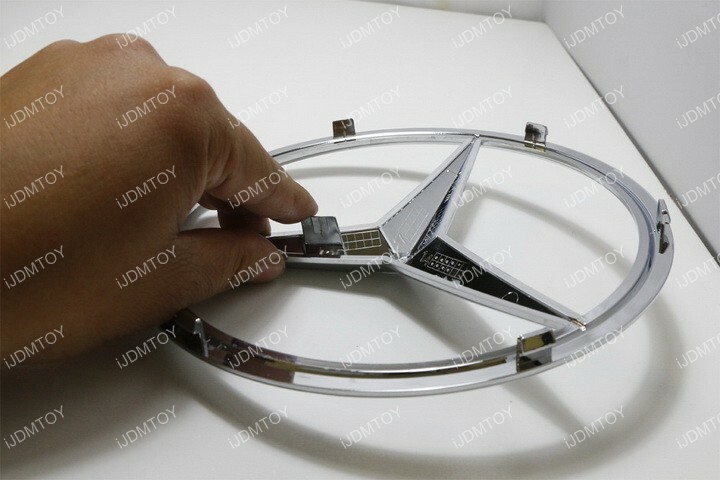 Step 4: Once the arms are aligned, you can push the Mercedes emblem down to attach to the illuminated LED base. 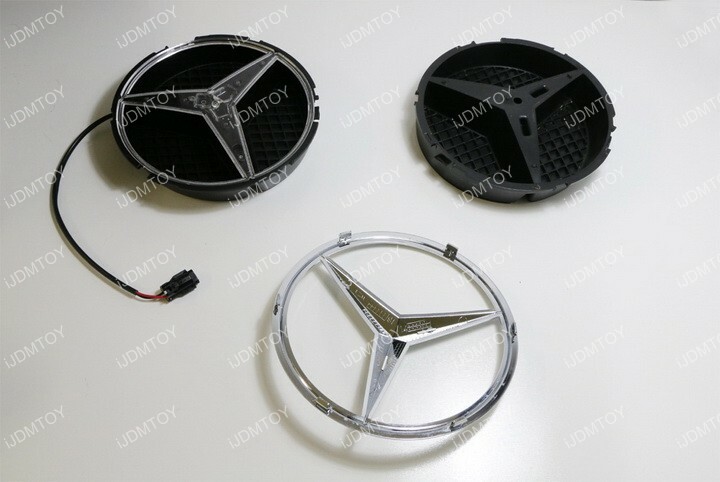 Step 5: Reinstall the original Mercedes emblem and the illuminated LED base together. Plug the adapter back to the vehicle (to Headlight +/- or Parking Light +/- or Daytime Running Light =/-) and then insert the illuminated LED base. Push the assembly to lock. You should hear an audible click. Q:: Why does the circuit board look slightly tilted? A: The circuit board is inserted into the LED base in a slightly tilted manner in order to accommodate the all of the 3 points of the emblem. The 3 points are not evenly spaced apart (though they may appear to be) so the LED circuit board needs to be oriented in a slightly tilted manner to disperse the light equally among the 3 points. 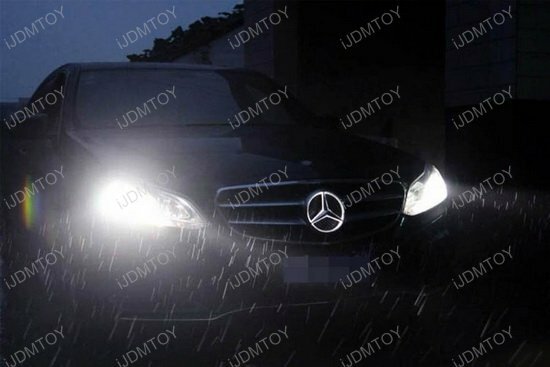 Q: How to I power up the Mercedes Benz LED base? A: Plug in the LED emblem to the extensions wires. Tap the wires to an existing 12V power source such as headlight +/-, side marker light +/-, or daytime running light +/-. Q: If I removed the small tabs on the factory emblem during the installation process, will I still be able to put the factory emblem back onto the existing base? A: Yes you can. 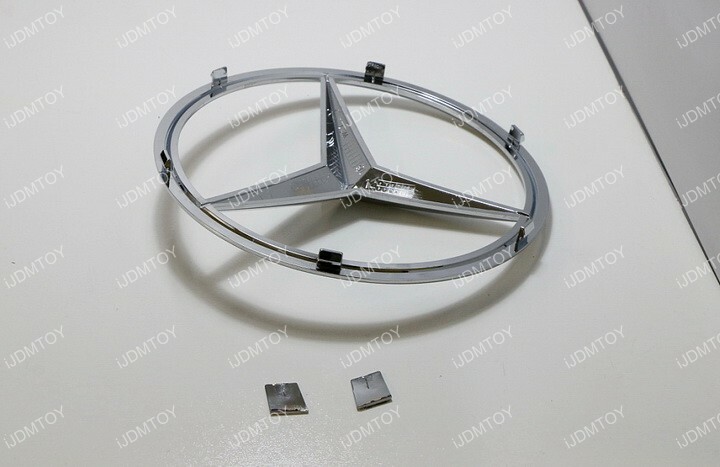 The small tabs are actually used for reference purposes during the emblem assembly at the Mercedes Benz factory. 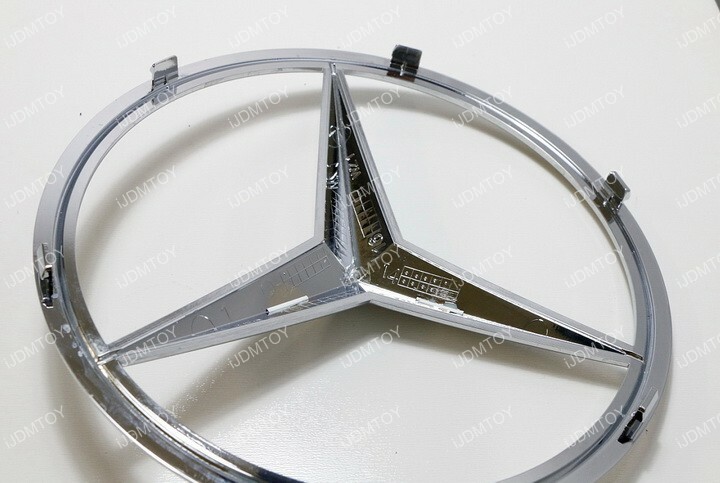 The 3-points on the emblem are not equidistant so the tabs make it easier during the assembly to see which direction the star is connected to the base. Q: Why is the glue in the center not distributed evenly? A: The purpose of the glue is to secure the panel to the LED lights. 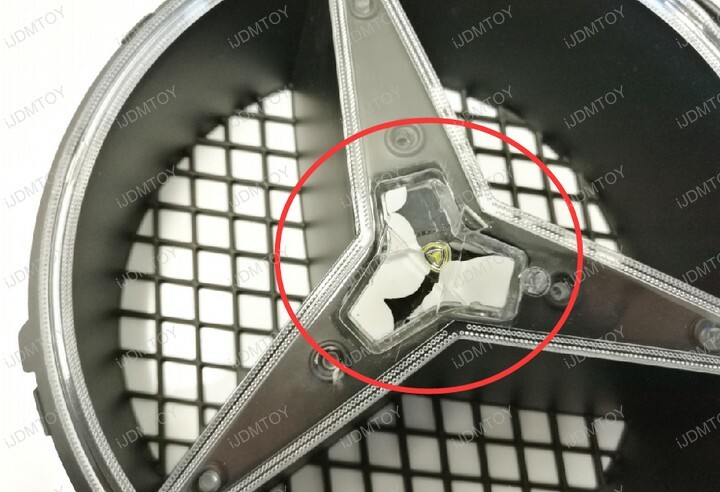 The unevenness of the glue will not affect the appearance or the performance of the LED emblem base. This is because the LED light travels along the edges of the acrylic. Once you place the emblem over the LED illuminated base, the glue will not be seen at all. Q: Why is the center acrylic piece removable? A: There is no issue with the acrylic piece being removable. It will lock and stay secure onto the black bezel once you place the star emblem over it. 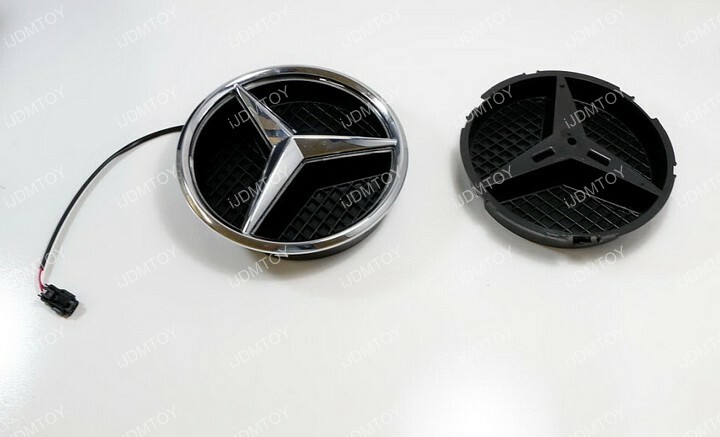 This LED illuminated base is a direct replacement off the original emblem's bulb-less base so you can get your original Mercedes 3-Point Star to fully light up, with only a minor modification required for installation. 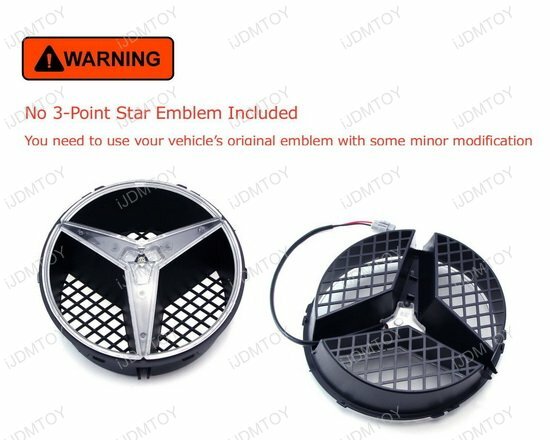 Before purchasing this product, please make sure your original Star emblem does not have the see-through base nor the solid Distronic Star (see picture 4 in gallery). Important: Only comes with the illuminated base. Emblem is not included. 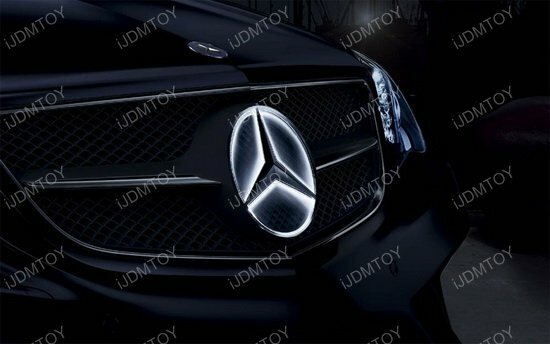 Installing this Mercedes-benz star emblem back light was easy! What a great buy! 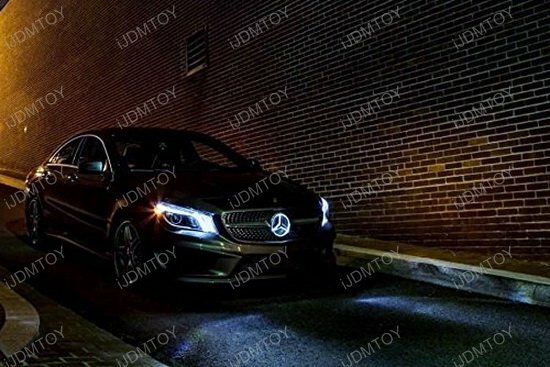 It shines awesome on my 2010 C300!